BJB’s “FP” (Fast Production) Series of products range from a 40 to 90 Shore A. You’ll find their 4 to 5 minute work time can easily be “demolded, tack free and tough” in under an hour. The 1:2 ratio and low viscosity makes these translucent materials easy to mix, pour and pigment. 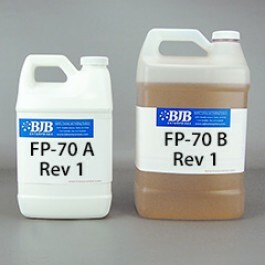 FP-70 REV 1 is ideal for hand casting or dispensed with our CPE equipment.